When people plan on going to Asia for vacation, they don’t think about Japan, China or South Korea. Most of them, especially younger populations, prefer to start in Thailand. The country is considered the gateway to the tropical Southeast Asia region. It sits right in the middle geographically, and is in the center of every Asian country you may be interested in visiting. 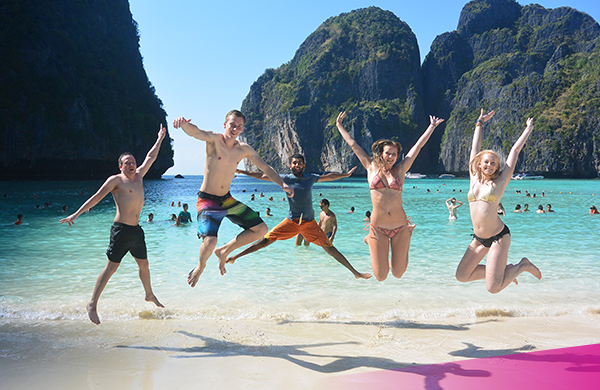 Most backpackers see Thailand as the starting point for their Asian backpacking escapade. In 2017, around nine million tourists visited the land of smiles. The country is considered the region’s top spot for vacations and tourism. It offers a variety of delicious food, amazing culture, and impeccable nature. I, myself, got enticed by this majestic country. I’m pretty certain if you get there, you will learn a thing or two in life. I’m not sure if its culture shock, but here are some things I learned while travelling in Thailand. Thailand can be cheap, very cheap, especially if you go with the flow of locals and live like a local. Bangkok, being the capital city, can be a little costly, but anywhere else in Thailand is a gem of affordability. As you explore the northern and southern part of Bangkok, you get to experience cheaper and more affordable cost of living. A livable, cheap guesthouse can be priced to as little as 200 Thai Baht or $6. In addition, you’ll never be hungry in Thailand, as long as you are up for exploring their street food. Food stalls can be found everywhere in the country, and prices are very affordable, with adequate service. This might not just be an isolated case in the country, but I saw a lot of price discrimination for tourists. Almost all tourist spots have entrance fees and other additional expenses, especially in Bangkok, which is notorious for having different prices when it comes to tourists. The moment you start speaking in English, and they know you’re a tourist, the park and temple facilitators will ask for a price double the amount they would charge the locals. In local terms, foreigners are called “farangs”, and most certainly you get more expensive fees on many attractions. Maybe it’s their way of enticing local tourism? Probably induced by their warm climate, I find locals to very enthusiastic about shopping at malls. Malls, especially in Bangkok, are built almost side by side. Crosswalks are conveniently laid out for shoppers to cross from one establishment to the other. I got to hang out in a cozy coffee shop in the middle of the busy shopping district to people watch. By all means, I don’t mean bringing a stun gun or pepper spray with you everywhere you go. Okay, maybe that should be a staple in your bag wherever you are; bad guys are everywhere. But in Thailand, you need an extra layer of financial security. The country is full of exciting activities to try and experience. Apart from getting super drunk in Kho San Road, you get to exceed some of your limitations, once you are in the midst of a beautiful scenic nature. I mean, you get to be brave enough, and feel encouraged, to do almost anything when you are in paradise. I went kayaking in Krabi, south of Thailand; this beach area is filled with beautiful limestone and clear sparkling seas. Admittedly, I got too excited kayaking, and ended up going too far from where I planned to be, and ended up on the edges of sharp rocks. Unfortunately, I stumbled on them and got scratched up pretty bad. Worst of all, when I was trying to get back to my kayak, I touched a sea urchin and got stung. Fortunately for me, I was covered for medical expenses, and got the immediate medical attention I needed. So, based on firsthand experience, I can wholeheartedly recommend you take steps to protect yourself, especially if you’re an older person, while visiting Thailand. Bangkok roads have the tendency to be one big parking lot, especially in rush hour. So, if you ever want to go around and do some city touring, you might consider walking, as opposed to driving. Not only do you get away from insane traffic, but you also get to see sights you won’t normally see when riding in a cab or train. I believe walking around lets you immerse yourself in the country far better than any other mode of transportation. I’m not sure about the quality of tap water in Thailand, but water bottles are everywhere. And they sell a lot of them in convenience stores. To top it off, for some reason, they even give you a straw for drinking. I mean, why? Not sure where that stems from, but I personally bought my own water bottle when I figured out this system. I think it’s safe to refill it in your hostel or hotel.